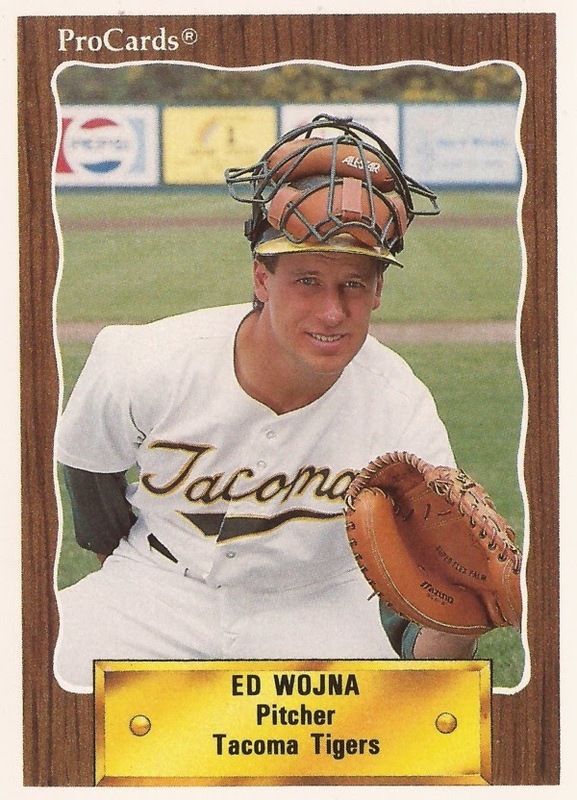 Ed Wojna just hoped he wouldn't play his career out at AAA. Not after he'd seen the majors, for a second season. "I was glad to contribute while I was there," Wojna told The Associated Press of his time at AAA Las Vegas in 1986, "but the goal of all of us is to be called up. This is where I've got to get some quality starts in and open some eyes for next year." Wojna spoke to The AP after an eye-opening performance where he threw a complete-game, three-hitter, without giving up an earned run. Wojna also made the Padres out of spring training the next year, in 1987. But he ultimately couldn't replicate those performances, staying only briefly that year and making only one more return to the majors two seasons later. He played his last season, in 1990, at AAA. Wojna's career began in 1980, taken by the Phillies in the fifth round of the draft. He didn't sign until November, pushing his first pro games until 1981. The hurler played that first season at single-A Spartanburg, going 11-13. He made AA Reading in 1983, going 13-7, with a 3.67 ERA. In May for Reading, Wojna nearly pitched a perfect game. He pitched to the minimum, 27 batters, only allowing a double, a double soon erased on a pick-off, The Nashua Telegraph wrote. That September, the Phillies sent Wojna to the Padres in a five-player deal. Wojna spent his first season at AAA in 1984, at Las Vegas. He went 14-8, with a 5.08 ERA. In 1985, he got called up to San Diego. With the Padres, Wojna started seven games, getting into eight more in relief. Overall, he went 2-4, with a 5.79 ERA. Wojna picked up his first win in June, over the Giants. It also came in his second start, which Wojna told The AP he used as learning experiences. "The main thing I've found is to be aggressive," Wojna told The AP. "Once you reach the major leagues you might feel the need to be more perfect. I've learned that the same pitches that get Triple-A batters out are the same ones that get big-leaguers out. The difference is the big-leaguers cause major damage with the slightest mistake." Wojna returned to the Padres for that September in 1986, but not before suffering a minor back injury and learning a new skill, pitching inside, The Los Angeles Times wrote. That work paid off with his call back to the bigs. "He (Wojna) looks much more confident, more aggressive and he's working faster," Padres manager Steve Boros told The Times after Wojna's return. "And when he got behind in the count, he'd get upset with himself and be determined to do something different. In the past, we didn't see that from him." In seven starts, Wojna went 2-2, with a 3.23 ERA. Going into 1987, Wojna then made his bid to make his stay permanent. Toward the end of the spring, it was down to Wojna and another pitcher for the fifth starter spot, The Times wrote. Wojna was preparing himself for the news that it wouldn't be him. "If I get sent down, I'll be able to handle it because of the personality I am," Wojna told The Times. "I have won 31 games at Las Vegas in parts of the last three years, and if I have to go back for a fourth year, I'll try to start out with a bang." Wojna, though, didn't have to worry. He made the team. But Wojna couldn't stick. In five outings, three starts, he went 0-3, with an ERA nearing six. He was then sent down. He didn't make it back to San Diego. By 1988, he was with the White Sox, in Vancouver. He joined the Indians in 1989, getting nine final major league appearances. With Cleveland, Wojna got three starts, going 0-1, with a 4.09 ERA. His career finally ended in 1990, with the Athletics at AAA Tacoma. Back in 1987, after being sent down by the Padres, Wojna responded with disappointment to The Times, but also optimism. "With the type of character I have, I look for positive things," Wojna told The Times. "At least I have a job. I'm not on the street looking for work. If they need someone to be called up, I want to make my name first because of quality performances."